SENTINEL® S Bonding Adhesive is a solvent based contact adhesive specially designed for adhering bare backed SENTINEL PVC membranes and flashings to a variety of substrates for horizontal or vertical applications. 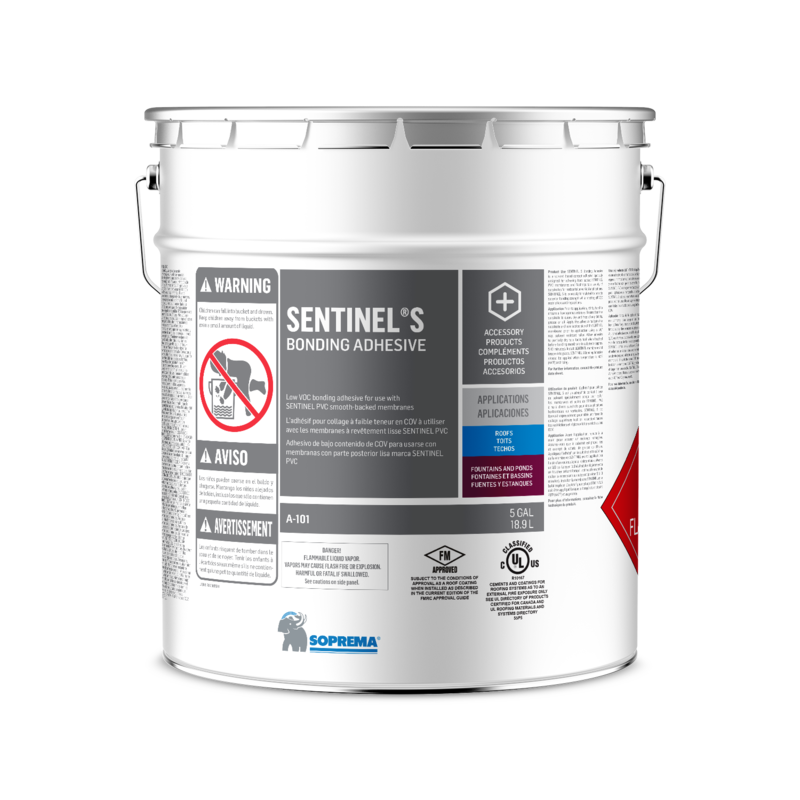 SENTINEL S is expressly formulated to provide superior bonding strength while meeting all VOC restrictions and regulations. SENTINEL S Bonding Adhesive is designed for use with SENTINEL bare backed membranes and flashings over approved substrates. Prior to application, stir by hand to ensure a homogenous mixture. Ensure that the substrate is clean, dry and free of any debris, grease or oil. Apply the adhesive to both the substrate and bare backed side of the SENTINEL membrane prior to application using a 3/8” nap, solvent resistant roller. Allow adhesive to partially dry to a tacky feel when touched before bonding membrane to substrate (approx. 5-10 minutes). Install SENTINEL membrane and broom into place. SENTINEL S Bonding Adhesive should be applied when temperature is 40°F (44°F) and rising.